Choosing Pam Tanowitz to choreograph a commission for Martha Graham Dance Company highlights Graham’s ever-growing legacy as it zigzags through generations. Tanowitz’s style is most often compared to that of Merce Cunningham’s—formal, angular, classically-based, rigorous. Before founding his own company, Cunningham danced with Martha Graham. And while their choreography differs in innumerable ways, he retained her senses of plasticity, theatricality, and purity of line. These elements can be found In Tanowitz’s new work, Untitled (Souvenir), seen at the Joyce Theater on April 11. And like Cunningham, Tanowitz’s work is more cerebral, and less emotional and expressionistic, than Graham’s. Tanowitz really pushes form, articulating the limbs tautly, and inventing witty traveling steps that are simple, yet new, such as hopping on one foot with the other leg at 90º, foot flexed. Port de bras defy convention, and like Merce, the torso often creates odd angles with the pelvis and legs. It is not what you’d deem organic movement, but highly thought-out and experimental, given the same old human body. For all of Tanowitz’s formality—underscored by Ryan Lobo/Ramon Martin’s elegant, black & white columnar jumpsuits and pieces—the work is couched in humor. Those at rest observe the others dancing, as if in rehearsal. They gather and form a handsome tableau in the finale. The other premiere on the program (there were three different slates) was Deo, by Maxine Doyle and Bobbi Jene Smith. In stark contrast to Untitled (Souvenir), the dance for eight women employed a highly expressive vocabulary. Leslie Andrea Williams, standing alone, flinched with increasing movement until she contracted deeply. The dancers lay on their backs but for their legs and heads, which floated off the ground listlessly. The women clumped together, with little space between one another, tottering across stage like a floating raft. One arrayed her limbs apart from her body, and resembled a spider. Low, wide squats and contractions lent a primal feel that summoned the power of Graham’s vocabulary. 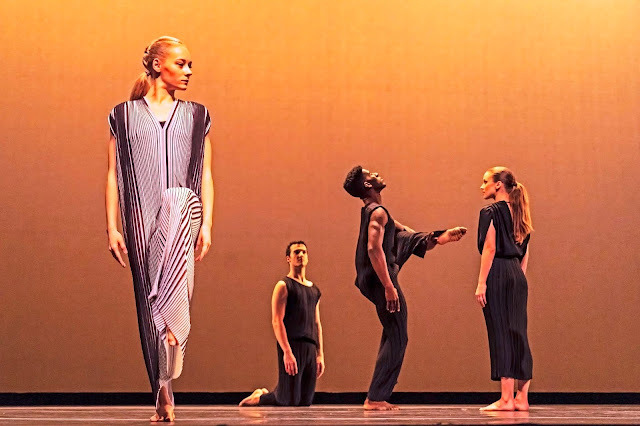 The beige/mocha-toned dresses (by Karen Young) evoked slightly more modest versions of those worn by Pina Bausch’s women in her Rite of Spring, and gave the similar impression of flesh. Deo created a hermetic world which made me feel as if I watched a private ritual that held deep meaning for its participants. The Graham works performed were Errand into the Maze and Chronicle. A willowy Xin Ying and brute-like Ben Schultz performed Errand, a concise and epic telling of the Minotaur tale; Isamu Noguchi’s spare but strategic set pieces are always thrilling to re-see. And Chronicle remains one of Graham’s high points, its urgency and rebel- summoning drumbeat as fervent as when it was created—as Graham refused an invitation by Hitler to perform in the 1936 Olympics. Williams danced the opening "Spectre" solo, a masterpiece portrait of an individual’s physical and spiritual strength danced breathtakingly well, plus a demonstration of Graham’s brilliance with costuming as drama. (The double disc podium she stands on seemed to be cleverly repurposed in Tanowitz’s work, albeit standing on its edge.) The stage-crossing “défilé” exercises have retained their speed and drive, and are a reminder of the light of perseverance hope in dark times—a useful notion at the moment. Choreographer Crystal Pite harnesses the potency of the stage and all its components to create an atmospheric microcosm within each dance. Hubbard Street Dance Chicago performed three of them at the Joyce recently, giving New York audiences a concentrated, if bleak, dose of an accomplished choreographer whose work is primarily seen here in mixed repertory programs. The company, under the artistic direction of Glenn Edgerton, also brought a program of work by Ohad Naharin. In the first of two Pite duets, A Picture of You Falling, the lighting design by Alan Brodie is the de facto set design—the lamps, fixed on poles, are on rolling stands that form a semicircle upstage. Dancers move through and around them. Jacqueline Burnett and Elliot Hammans performed to a mellifluous voiceover by Kate Strong, Owen Belton contributed supplemental music. To the line, “This is the sound of you collapsing,” Hammans sinks, articulating each limb onto the floor; descriptive hand gestures are done with a theatrical flourish. The overall effect integrates the movement with the text/sound and lighting, creating the sense that one element could not be removed without subtracting substantially from the whole. The second work, The Other You, was also a duet, which alone is a quietly radical gesture in the world of modern dance. This is especially for an out-of-town company in New York, where there’s a tendency to pull out the stops with large ensemble works that vary in tone. It was performed by Michael Gross and Andrew Murdock, who appeared interchangeable at a distance, with the same buzzcuts and suits. One mimed pulling up his knees with invisible marionette strings. A found soundtrack by Belton of rain, traffic, dogs barking, and Beethoven’s Moonlight Sonata, accompanied the work, which also used the same lighting fixture semicircle. The second man joined; they mirrored one another in sync, seemingly two sides of a coin. Again, all elements of the piece cohered to create a taut, gritty, urban atmosphere for 15 dancers in suits (by Nancy Bae) who rush on and off, flowing around a soloist. 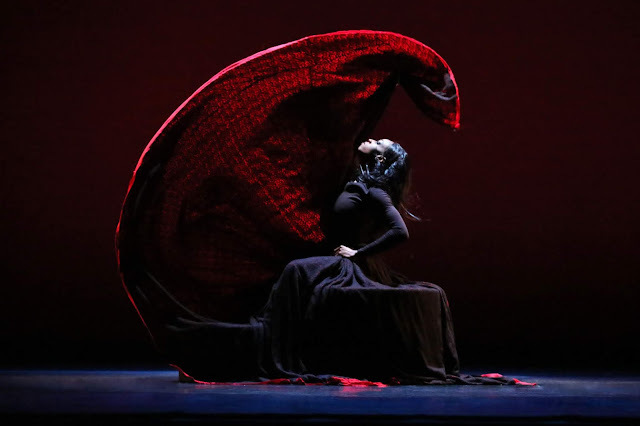 Pite does not utilize a conventional dance lexicon, instead connecting graphic, articulated poses with flowing movement, channeling energy into organic-feeling phrases. While it’s related to the more commercial “contemporary” style seen in popular tv dance competitions, it doesn’t exist only to serve freakish feats of technical prowess. The chiaroscuro lighting (by Jim French) and the urban soundscape (Belton again) contributed to the overall feel of a busy city sidewalk at night. It ended a cohesive program notable for its dynamic and atmospheric continuity, as well as Hubbard Street company's all-around excellence. Vertigo Dance Company had a two-night run at Baryshnikov Arts Center on Mar 5 & 6. It’s a shame it wasn’t longer so more New Yorkers could have had a chance to catch its wonderful piece, One. One & One. This Israeli company, led by Noa Wertheim, further burnishes the country’s reputation for producing notable choreographers. And while each one furthers her/his own individual style, there seems to be a physicality, sensuality, and interpersonal connection in common. At the start of One, a man pours dirt in lines across the stage as Shani Licht stands and begins to undulate and bend backward, her long hair grazing the floor. Three men approach her, divide her tresses in three, and by crossing over and under one another, braid her hair. Eventually all 10 dancers enter, and each struts downstage and throws the audience a look. Here, the varying score by Avi Belleli crescendoes into loud rock section as the dancers move with more urgency and violence. More dirt is spread. The first woman is joined by another; they face each other separated by only inches, and move in symmetry, highly sensitive and in tune. A woman charges across the stage at a man, flinging herself at him; this repeats. They slap their chests, legs bent deeply, summoning images of gorillas asserting themselves. In groups of four, they soften their movement, sweeping their legs in circles in the now pervasive dirt, as the sound of muffled blasts combines with plangent guitar, evoking—as does the dance—violence and beauty. They ripple their bodies, energy phasing from head to toe; a woman runs figure 8s around her curves. They run backward, bent forward, arms flung up and out like a diving cormorant. Music that might accompany a line dance at a party accompanies big chassees, spins, and deep plies; one man is carried aloft by three mates as if seated. Hagar Shachal goads the men, lunging at them as if suddenly provoked, and they begin to chase her as she evades their grasp. They finally catch her and subdue her, pinning her down until she subsides fully. A solo by Etai Peri features effortless, silky, upright movement, legs floating high, and a rippling torso. The dancers often evoke animals, moving individually, but sometimes en mass, communicating wordlessly and with physical cues. One man remains lying on the dirt as the group moves ensemble, beating their chests and leaping like frogs; the loner grabs one man’s ankles as if to beg for a savior. The music swells like an orchestral film score, punctuated by twinkling keyboard notes. As the lights dim, the dancers recede, flapping their arms slowly. Wertheim also established the Vertigo Eco-Art Village in Israel, a learning center that promotes sustainable, eco-friendly practices. This attention to one’s surroundings and a heightened awareness and appreciation of the environment perhaps informs Wertheim’s movement and the company members’ interactions. Well-produced video, tight direction, and a welcome reminder of the breadth of Comfort’s warm-hearted oeuvre and the tightly knit dance community. A dream mini-festival of companies and dances that reminded us of City Center’s sometimes overlooked history. Displayed Morris’ musical insightfulness and the intelligence to embrace simplicity, even if it pointed out the diminished dance offerings at Lincoln Center. This mesmerizing gem performed by a Dutch troupe was overshadowed in a strong festival that is more focused, if less populist, than ever. Taylor Stanley’s dynamite solo was the transcendent performance of the year in a work that felt revolutionary in the Koch Theater. In contrast, this subtle work had just enough narrative implication. One of five fascinating choices for a continuing series done in-the-round. Subtle but gut-wrenching movement metaphors and well-paced dynamics building in two acts to an exuberant and elating finale. Interwoven stories, all somehow involving trees, made me realize how much I take them for granted. In wartime, seemingly neglected children have been cared for by a colorful supporting cast of characters. History and a crime make for surprisingly compelling reading. Plus, a killer title and book design. Redemption and personal re-invention sneakily prevail in this novel with many odd characters. The fates of a roster of characters comes together at a powwow in Oakland, CA.